JJC LCP Series Guard Film is ideal for camera screen protection. The film has following characteristics: the anti-reflection coating helps minimize annoying surface glare under bright lights; the hard coating on the film helps avoid scratching by hard objects; the unique anti-smudge coating reduces fingerprints and facilitates cleaning. 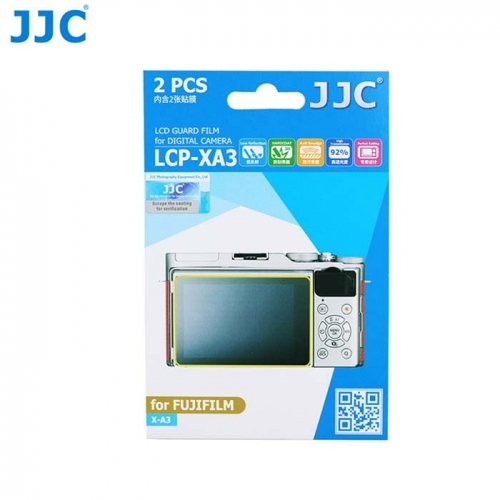 JJC Guard Film has a high transmission up to 92%, in this way, it ensures screen clarity. A special silicon adhesive allows for easy application and removal without leaving sticky residue. Every guard film is strictly tailored for the specific camera screen in order to fit the screen perfectly. The removable protective fronting and backing hold the base film securely to ensure a brand new film be attached to your screen. The removable protective fronting and backing with stickers on provide you an easy installation. Two sets of guard films are included in the package for replacement in case of need. Each set provides an extra cleaning tissue to make sure your LCD screen is free of dirty before installation. For cameras that have sub-screens, fitted smaller guard films are also provided. It is easy to install without trapping any air bubbles, and is just as simple to remove.